We arrived in Minneapolis late Wednesday night, excited for the North Star competition. Arriving at the Mariucci Arena bright and early Thursday morning, we set up our pit, modified our shooter and intake, uploaded new code for auto-aiming high goal shooting. Without any huge new additions, we were able to make many practice matches. During this time, our PR met with with pit scouts and our scouting team practiced with the new database system, while our chairman’s presenters attended in a chairman’s exchange and practiced in an elevator! On Friday, we started off the competition strong with 8 ranking points after 2 matches, ranking 1st! We competed in 7 of our 8 qualification matches and demonstrated our working autonomous of crossing the low bar and scoring a high goal as well as consistent high goal shooting. The Chairman’s group also gave their presentation in the afternoon. 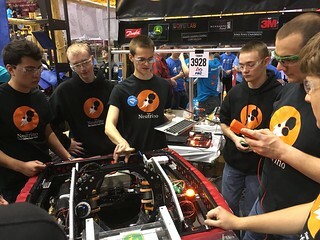 After competing in our last match on Saturday morning, we finished ranked fifteenth. During alliance selections, we were the 1st pick of the 4th seed alliance captain, 4778 Stormbots and were later joined by 3026 Orange Crush. We got off to a rocky start in our first quarterfinal match, breaking an intake chain and 4778 breaking a drive chain. Joined by backup bot 2225 R.U.S.T., we won our next two quarterfinal matches and advanced to the semifinals. Against the 1st seeded alliance, we won our 1st semifinal match despite a drained battery. Sadly, we lost the 2nd match and our semifinal tiebreaker match by only 1 point. During the awards ceremony, we won the Judges Award! This award is given to a team the judges feel should be recognized for showing unique efforts and performance. It was an exciting experience for the freshmen and sophomores who got to high five the judges for the first time, and a nice way to end the season for the seniors. Congrats to teams 2175, 3130, and 3042 for winning the competition and qualifying for champs!